The most charming and special of all female characters can be promoted to a rose captain. Women characters with the most roses are eligible. 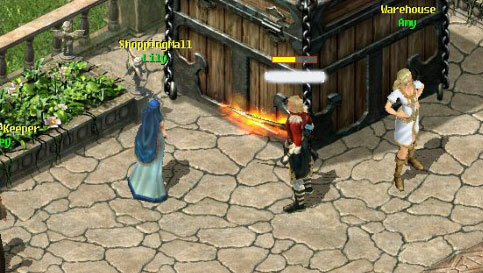 When this happens, they can share 70% of the legion's Battle Power. How many Rose Captains can a legion have? 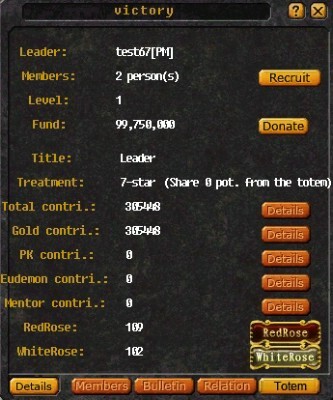 Click "RedRose"/"WhiteRose" button on legion screen to check who has won the most roses in your legion. I have a higher position when I am eligible to be a Rose Captain? Which position shall I take? You will take the higher position, and the position of Rose Captain will be awarded to the next eligible lady. How can I be promoted to Rose Captain? When you are eligible to be a Rose Captain, you will take this position and enjoy 70% of your legion's battle power after server's maintenance. How many roses have I received? 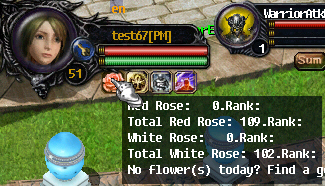 Click Rose button to check your roses and the rank in your server. Where can I buy White and Red Roses? All kinds of roses are available at the shopping mall (Market 285,473). Do not hesitate to show your admiration to a lady.